And you thought you were getting old. Ludwig van Beethoven, one of the most widely-known German composers, was born 245 years ago today—on December 17th, 1770. His compositions are not only brilliant, but some of the most elegant pieces were composed within the last 10 years before his death. Given he was quite deaf by then, his musical accomplishments are the hallmark of determination and passion. 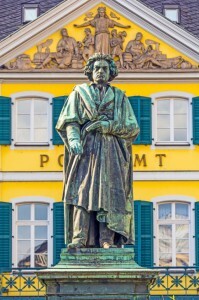 Beethoven lived with his parents and siblings in Bonn, Germany. He also wasn’t the first of the Beethoven family to pursue a musical career. His father Johann was a court singer of mediocre ability, but his grandfather (and namesake) Kapellmeister Ludwig was a highly-treasured, successful musician in Bonn. Unfortunately, the pressure for young Ludwig to surpass the grandeur of his grandfather and become a musical prodigy had a heavy price. His father was known to be very brutal in his lessons, with punishments involving floggings, being locked in a cellar, and being kept awake to practice. Despite tragically being forced to devote his entire childhood to music, Beethoven lived on to become one of the greatest musical composers of all time, and Germans will proudly agree. One of the things Germany is known for beyond their leckeres Bier (delicious beer for those not fluent in Deustch) and festivals is their prominent music culture. After all, the famous Sebastian Bach was also German. We like to think Beethoven inspired, and continues to inspire, the celebration of incredible music. In our celebration of this great composer’s birthday—and someone always being older than us—we’ve picked out some neat Beethoven facts to share with your music-minded mates. The oldest record of his earliest composition is from 1782, and is a 9-variation piano set composed at the young age of 12. There’s a diary of his daily life as lived in Vienna in 1792, with such entries as finding a wig-maker to locating a piano. Beethoven’s deafness began in 1796, at the young age of 25. Clearly, this didn’t stop him from becoming a musical genius. There’s speculation on whether or not Beethoven’s first symphony, performed at the age of 30, was a (intentional) joke because of its radical introduction. The “Heiligenstadt Testament”, written in 1802 and published in 1828 a year after his death, proclaims his despair over his deafness and its self-perceived impact on his musical career. AESU offers several trips to Germany, including: Euro Focus, Great Escape, and Euro Spree. Explore Germany and its beautiful scenery, plus experience German bier and the awesome music culture! This entry was posted on Thursday, December 17th, 2015	at 4:00 pm	. You can follow any responses to this entry through the RSS 2.0	feed. Both comments and pings are currently closed.